Purpose: Created a course blueprint which included detailed lesson plans, goals & objectives for each topic along with detailed interactive activities. Learner Audience: Young adults (aged 18-24) who are participating in a 21 week workforce training program designed to teach them the necessary business skills needed for their internship assignments with corporate partners. Revamped existing out-dated course content for Customer Service, Project Management and Introduction to Computer Applications and transformed it into relevant, real-world, bite-sized blocks of learning content that could be absorbed by the learning audience. 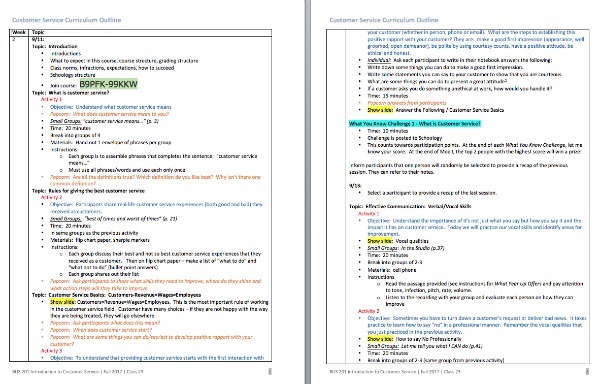 Developed detailed course outlines for classroom training sessions that served as a guide for the instructor and "train the trainer"
Created daily lesson plans on specific topics such as body language, vocal qualities, building rapport, rules for giving effective customer service, service culture and email communication. Created a mix of PowerPoint training notes and fun interactive activities to teach the project management. Created daily lessons plans that covered project management basics, the 5 phases of project management (initiation, planning, execution, monitoring & controlling, closing), change management and data analysis. Each lesson topic had a specific learning objective aligned with it.